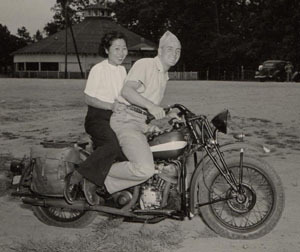 After Susan Ahn Cuddy graduated from Smith College officer training school, she was sent to work in Naval intelligence after Secretary of the Navy James Forrestal saw her at an event. But initially the brass in Naval intelligence weren’t so certain about having an Asian woman in their midst. The captain of the station was appalled. He couldn’t believe that this Asian was on his station So for six months I didn’t do anything, but file. And then after that, he was still nervous. Ahn eventually became the Navy liaison with the Library of Congress, and after the war would continue working in the intelligence community, in the National Security Agency. This photograph of Ahn and an unnamed sailor comes from the collection of Susan Ahn Cuddy and the Island Mountain Trading Co.